Google has launched the Research tool for Google documents. 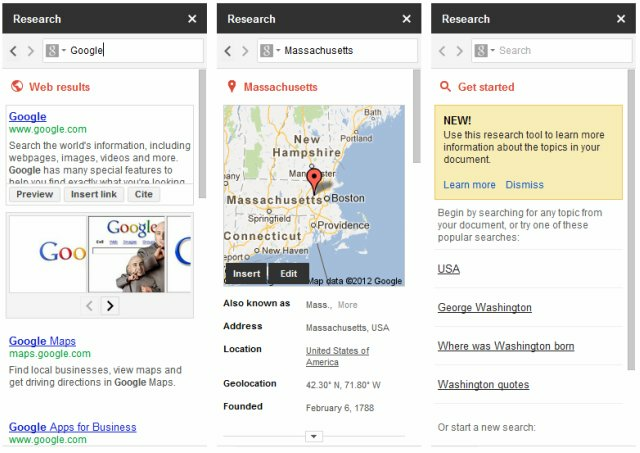 This new tool allows you to add Google Search content directly to your document without leaving the page. Right now when you login and create a new document you will see the new pane on the right side. You can reopen the tool anytime by clicking Research under Tools, or by initiating a search. To initiate a search based on text you have already written you can right click on any word, or highlight a phrase and right click, to find the research function. Ctrl+Alt+R on Windows or Cmd+Alt+R on Mac are key shortcuts you can use also. If you prefer, when the tool is open, there is a search field at the top so that you can search for anything you want at anytime. The tool is not available in spreadsheets or the other file types. The Research tool enables you to add a lot of different media that can easily be edited. Perhaps the best feature in my opinion is that any content inserted is automatically cited if required with a superscript number and footnote containing a link to the content along with a page title and date if available. Images and maps can be dragged to the document while text is added or cited by hovering over it. Any web page can be previewed in another pane that comes up next to it; even the webpage screenshot can be dragged to your document. Here is a quick sample document I made so that you can see the footnotes..
Give it a try and let us know what you think. I wish I had this in school!